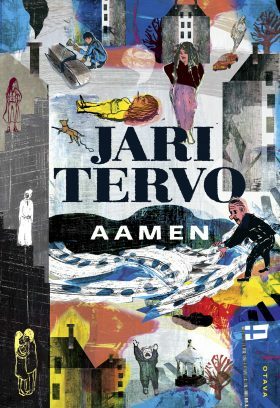 Satiric one-day novel opens a panoramic view to the mind of the Finns, famously as unpredictable as the weather. 80 year-old Leo walks around Helsinki, pushing a bouncy castle in a carriage. He is going to attend a demonstration to defend the Nation and finally marry the love of his life, both on this same April day. He is unaware of the police chasing him, suspecting him of a crime. After Leo suffers a stroke, 29 other narrators get the chance to tell their stories – and so does the omnipotent choir in social media.